In addition to the other great products we provide, our heat pump selection is second to none. These fantastic machines offer four seasons of comfort in a space saving cabinet. Despite the name, it cools the home as well as heats. 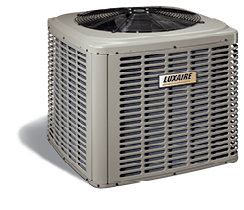 Luxaire heat pumps offer high-efficiency comfort which translates to greater energy savings for you. Acclimate™ Series heat pumps are ENERGY STAR® qualified models that offer at least 15% to 25% higher energy efficiency than standard models — plus, an innovative SilentDrive™ Comfort System for very silent operation.creates an operating cycle that works best for your locale. 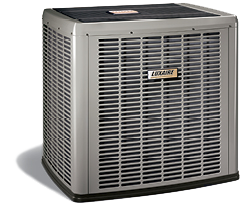 LX Series heat pumps fit your needs while reducing your utility bills. SEER stands for the Seasonal Energy Efficiency Ratio and is the measure of efficiency by which the cooling process of air conditioner or heat pump systems are rated. The higher the SEER number, the greater the efficiency, and therefore the greater the energy savings. Today, U.S. regulatory agencies require all new products to have a 13.0 SEER rating or better. The term HSPF stands for Heating Seasonal Performance Factor and is the efficiency measurement used to gauge the efficiency of the heating mode of heat pumps. Again, the higher the number, the greater the efficiency. Today’s models are required to have a minimum 7.7 HSPF. Unlike conventional single or two-stage motors, a variable-speed compressor runs at a wide range of speeds to precisely control the flow of heated and cooled air throughout your home. A variable-speed compressor is able to ramp up and down its performance in small increments in order to deliver maximum comfort and efficiency. Two-stage cooling means the air conditioner or heat pump has a compressor with two levels of operation: high for very warm climate and low for milder temperatures. Typically the low setting is adequate to meet household cooling demands 80% of the time. A compressor operating at the low setting will run for longer periods of time and produces consistent even temperatures throughout the day. Longer cooling cycles translate to quieter, more efficient operation. Single-stage cooling means that the air conditioner or heat pump has a compressor with a single level of operation. The compressor is either off or on depending on the cooling demands of the home.